The Lucena position is an endgame position named after Luis Ramirez de Lucena and it is one of the most famous and important positions in chess endgame theory. This theory occurs in Alessandro Salvio's Il Puttino (1634), a romance on the career of the chess player Leonardo da Cutri as it's given. The position shows that White's aim is to either progress his pawn or to take Black's rook. Because either of these outcomes will give the White the upper hand to win the game. Though the White pawn is moved forward it can't promote to queen as it's own king is in danger. 2. Rd4 Ra1 3. Kc7 Rc1+ 4. Kb6 Rb1+ 5. Kc6 Rc1+ 6. Kb5 Rb1+ 7. Rb4! Denying the Black rook any way of hindering the progress of the White pawn. White shielding his king and pawn with the rook in this way is known as building a bridge. Alternative approaches are no better for Black to stop White from carrying out his plan. 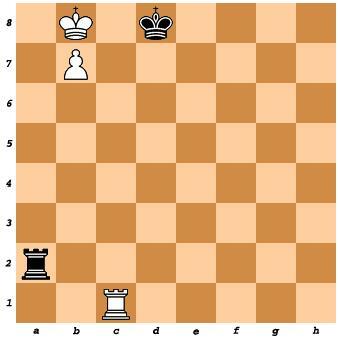 This position is very important in endgames as it is a known win and both the players progress the game to finish in this pattern. Play through the moves a few times to get the hang of it. This technique is so much more than some trick you may never use. This very situation crops up again and again. It is a crucial piece of theory for every chess player. The best thing is it only takes a few minutes of study and you can apply your new skills over the board when next you need them. I would have never thought of this on my own. I am not a big student of historical chess although I do love playing and want to get better. This makes me think maybe I should rethink my strategy and do a bit of studying! A good strategy to know for pulling out a win from a tough position. If you don't know how to play a situation like that it could get really drawish so it's good to have an idea of what's effective if it does happen. As an amateur chess player I have found myself in this situation many times. I never really knew how to end the game to my advantage. Thanks to the Lucena technique I now know how to end the game successfully. The Lucena Position in the chess endgame with only the pawn and the rook vs rook in the final moves of the game but it is quite manageable to play the Lucena technique and win the game. That plan is not so easy to see for the beginner but is very smart. Most people with no prior knowledge of this ploy would just think, "draw" and give up any thoughts of winning. Once again we see that there is more to a position than meets the eye.